The site of a massacre of Lakota Indians perpetrated by the US Cavalry in 1890 during the final stages of the so-called “Indian Wars” in which white America more or less ended all resistance by the original native peoples. Wounded Knee is thus a particularly black spot in the later stages of the history of the conquest of the Americas by Europeans. The site of the massacre lies in what today is the Pine Ridge Indian Reservation. There's a memorial panel and a small cemetery. In the nearby little town of Wall, South Dakota, USA, there's a museum about the Wounded Knee massacre and its historical context, which is well worth visiting when in the area. More background info: The genocidal driving out of the indigenous populations of the Americas by white conquerors and settlers is one of grimmest and longest drawn out dark chapters of world history. However, most of this took place so long ago that it normally wouldn't fall within the "modern period" scope that is part of the concept of dark tourism. In that sense it is similar to another great crime of human history: the slave trade – see however Maison des Esclaves. Wounded Knee is therefore picked here as the one entry representing the crimes against the native peoples of America (without denying that there had been countless ones before at other sites), also as the incident is seen as one of the last significant event( in the context of the "Indian Wars" of the late 19th century. At this point, a terminological remark is in place: the older expression "Indians" has of course been largely replaced these days by "native Americans" – by way of "political correctness", even though, as with most "PC" attempts at language cleansing, it doesn't actually improve things. Yes, "Indians" was "wrong", geographically speaking ... as it was based on Christopher Columbus's misconception that he had landed in India, before it became clear he had "discovered" a "New" continent instead. The extension to "red Indians" can even be taken to have racist connotations (like the unabashedly racist "redskins"). However, "Native Americans" is only a partial improvement: "native" puts it on the correct course, but the second element "Americans" takes it away again – now the natives are named (like the continent) after another early explorer/conqueror: Amerigo Vespucci. So it's a European name for the land and its indigenous peoples, one that the land didn't yet have when it was still theirs. So why should the allegedly PC "native Americans" be any better than "Indians", then? Arguably, it's even more offensive! So much for the continuing linguistic difficulties in dealing with this particular thorny historical legacy. Just 14 ½ years before the incident, the white Cavalry suffered one of its few defeats in the disastrously lost battles at Little Big Horn in which the infamous General Custer was killed by Sioux and Cheyenne (under Sitting Bull and Crazy Horse). Ever since, feelings of vengeance rose high amongst the whites – coupled, of course, with a bluntly racist attitude towards their "enemies" whom they saw as nothing but "savages". Another element that apparently played an important role in the run-up to the massacre was the development of the ritual of the Sioux "Ghost Dance" – a rite that the whites misinterpreted as aggressively directed against them, tantamount to a declaration of war on all whites. In actual fact it was rather a religious rite intended to provide spiritual strengthening … or some such thing (as an atheist, I'm no great expert when it come to anything "spiritual"). Before Wounded Knee, there had been increasing tensions, including various scuffles and skirmishes – and in one of these the legendary chief Sitting Bull, the veteran Little Big Horn hero and a keen supporter of the Ghost Dance movement, was killed by police on 15 December. The news travelled fast amongst the Sioux and further fuelled fears, tensions and mistrust (rightly so, as was soon confirmed once again). What exactly happened at Wounded Knee Creek on 29 December 1890 is not entirely clear, but suffice it to say this much: in the process of an attempt by the 7th Cavalry to disarm the men of a band of Lakota Sioux (the majority of whom were women and children, though) on their way to Pine Ridge Reservation, resistance led to chaos and a mass killing spree. 25 cavalrymen were killed too (many by "friendly fire"). But what really made the incident a downright massacre was the use of machine-gun-like artillery weapons ("Hotchkiss guns") with which the Cavalry mowed down the Sioux camped by the Creek – i.e. esp. the women and children. Some 200 were left dead by the shooting. Of those Sioux who managed to flee many died too – either shot by Cavalry setting after them or, if they got away, from hypothermia (it was winter, after all). Amongst the dead was also Sioux Chief Big Foot. Most white people back then saw the incident as the great "revenge" for Little Big Horn and the Cavalry were treated like heroes – but for the Sioux and Lakota it was nothing but a murderous atrocity. And it marked their final defeat. Not surprisingly, then, the massacre at Wounded Knee has remained a major event in American popular consciousness and numerous books, songs and films have been made about it. Today it is rather seen as what it was: a massacre, an atrocity, a crime, rather than being heroically glorified in keeping with the prevalent way of depicting the history of the USA in the media up until the late 1960s or early 70s (when movies like "Little Big Man", by Arthur Penn and starring Dustin Hoffman, revolutionized public perception). What there is to see: At the site of the massacre itself there is precious little to see. By the car park there's a large red plaque/panel with a short text providing a summary of what happened here. Interestingly, the word “massacre” seems to be a more recent addition – you can see that it's written on a piece of board that covers some older bit of text. I wonder what it used to say before – possibly “battle(field)”. 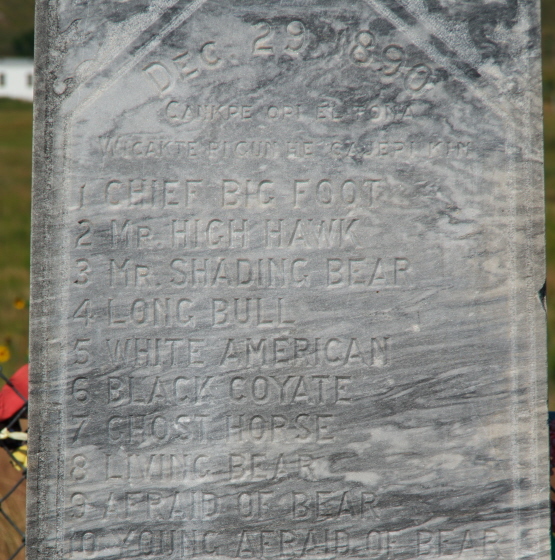 Other than that there is the cemetery on a nearby hillock where the victims were buried in a mass grave and where a central stone marker, erected as early as 1903, lists the names of the most notable victims, such as Chief Big Foot. The cemetery is apparently still in use. I saw several tombstones from more recent years. Pieces of colourful cloth are tied to the fence around the cemetery. Note that some of the Lakota locals are not fond of people taking photos up here, so at least try to be discreet. Back at the car park by the road there are some stalls where souvenirs are sold. One white guy was also offering some informational material about the history of the place. But mainly it is Lakota women who pounce on any visitor stopping here desperately trying to sell home-made jewellery, and in particular so-called dreamcatchers. You have to remember that unemployment on the reservation is incredibly high (at ca. 80%). The selling of such souvenirs is a way of alleviating the poverty. So this is a chance to “give something back” (as they say in ecotourism). My wife and I decided to buy one of the dreamcatchers we'd liked the look of, but as we approached the relevant woman again she had just sold it to somebody else. But she offered to make us another one of the same design on the spot. So we followed her to her clapped-out car and watched her putting our purchase together for us. It was also a good opportunity to chat and thus get a first-hand impression of the desperation of the residents of the reservation. While the woman was perfectly friendly towards us, she did not hide her disillusionment and frustration with the way the state treats her people. Basically they're given a choice of either living in poverty on the reservation or moving away in search of a better job, in the process of which they'd be forced to leave behind and abandon their own unique culture. As our dreamcatcher-making woman said: “We're like dinosaurs – they want us extinct”. At the Wooded Knee site is also a distinctive round building that at least at some time served/serves as a kind of visitor centre/museum/souvenir-shop. At the time I was there, though, it did not appear to be open (August 2015). However, there is a proper museum about the Wounded Knee massacre and the larger historical context located in the small town of Wall north of Badlands National Park. From Pine Ridge, south of the park, it's a 90 mile (145 km) drive to the north, through the National Park. En route, ca. 5 miles (10 km) north of the Wounded Knee car park you pass a sign that marks the spot where Chief Big Foot first surrendered to the US Cavalry, the day before the massacre. The Wounded Knee Museum in Wall tells the story of the massacre in full detail, but not only that: it provides a much wider-reaching overview of the history that led up to it as well as its aftermath up to the present day. It starts its dark story with the arrival of Christopher Columbus in the “New World” at the end of the 15th century, namely at a Caribbean island he named Hispaniola, where today Haiti and the Dominican Republic are. The genocide and exploitation of the natives started right there! The museum then concentrates on North America and shows how the original tribes were decimated as the whites pushed further and further westwards. The various betrayals and broken treaties are another particular subject here, as is the issue of how food was made a “weapon” – first through shooting the buffalo herds to the brink of extinction and later making the Lakota dependent on government food rations, which were cut at random in the run-up to Wounded Knee. The Ghost Dance and the assassination of Sitting Bull are other points brought up here. At the heart of the museum, naturally, is an almost painfully detailed account of what happened at Wounded Knee in December 1890. They even have a model of the topography of the site on which you can press buttons to make lights point out the various specific locations of importance at the site on that fateful day. The aftermath is also explored in detail, including how the press reported the events and how the quite different portrayals of it shaped the perception of the “Indians”. A main topic here is also the court of inquiry that was set up after the tragedy – and how it ended in a complete whitewash. A particularly touching personal story is that of Lost Bird. She was found as an infant amongst the dead, a very unlikely survivor of not only the shooting but also the extreme winter cold. As an orphan she was then adopted into a white family (as an “Indian relic”). But growing up she rebelled and, through taking part in Wild West Shows that travelled the country in those days, made her way back to South Dakota. But she didn't fit into the Lakota culture any more either. So she continued a sad life of strife and bad marriages and ended up dying of syphilis (contracted from her husband) in California. But she did come back to her culture of birth in the end after all, as it were, when her remains were reinterred in the Wounded Knee cemetery right next to the original mass grave. Amongst the modern-day aspects the museum touches upon is the campaign against sports mascots, logos and teams' names that involve reference to Native Americans, such as the American football team “Washington Redskins”, a name that many Native Americans not surprisingly find highly offensive. All in all I found the museum very interesting and certainly highly educational too; but it is not an easy one, largely lacking the media-mixes and interactive features that most people expect of a modern museum these days. Here you have to read a lot to get the most of it. If you don't mind that, it's absolutely recommended you visit this exceptional museum. Incidentally, the museum does make an effort of offering an easy, abridged path through the exhibition, namely by placing “in brief” summaries of just a few lines per text-and-photo panel at the bottom. But if you only rely on these, you won't learn much and will miss many of the most fascinating aspects. The actual Wounded Knee site, in contrast, is ultimately just a pilgrimage site. The long detour required to get there will probably be worth it only for the really dedicated dark tourist. Location: in a remote south-western corner of South Dakota, USA, within the Pine Ridge Indian Reservation, south of Badlands National Park, near the border with Nebraska. The Wounded Knee Museum is located in the centre of Wall, South Dakota, which is just north of Badlands National Park on the main east-west route of Interstate 90. The nearest larger conurbation is Rapid City. Currently the Wounded Knee Museum is housed at a temporary location at 600 Main Street on the corner of 6th Avenue, just one block down from Wall Drug – i.e. not by the gas station on the corner of Glenn St and 10th Ave (which is where the Google Map marker still puts it, at least when I last looked in March 2016). However, it is scheduled to move back to its original location and reopen there in May 2017. Access and costs: remote and only accessible by car; the Wounded Knee site can be visited freely, the museum charges an admission fee and has restricted opening times. Details: To get to Wounded Knee you have to have your own vehicle. And it's a long drive. From the closest larger town, Rapid City, it's a ca. one-and-a-half hour drive for ca. 90 miles (145 km) along SD-44 and Highway 27. From Wall it's a similarly long drive (see below). The plaque marking the Wounded Knee massacre site is directly by the road where there is a large car park too. The cemetery is best reached on foot from here (along a rough dirt track). The Wounded Knee Museum is more easily accessible, located as it is right in the centre of Wall, South Dakota, which is more famous for its kitschy Wall Drug Store but is thus firmly on the US tourist trail. Interstate 90 provides easy access from the east and west. Parking is not difficult to find nearby. From Wounded Knee it's a 90 mile (145 km) drive through Badlands National Park via Highway 27 and SD-44 and 240. From Rapid City it's a much faster 50 miles (85 km) along I-90. Opening times: in 2016 from 19 May to 15 October only, daily from 9 a.m. to 5:30 p.m. Mountain Time (GMT-7, an hour behind Central Time, which is used in the eastern two thirds of South Dakota!). There is some conflicting information: the museum's regular website gives the details above, but the associated museum blog states that the museum is closed altogether for the entire 2016 season while it moves its exhibition back to its original location by May 2017. If you want to stay overnight in Wall, a good range of motels offer accommodation, including a cluster of rustic “Frontier cabins” just south of I-90. There are also a couple of restaurants in Wall, but do not expect any exciting or high-quality food & drink out here. Time required: At the Wounded Knee site itself you only need a few moments at the plaque (the souvenir vendors can hold up things quite a bit, though) and also at the cemetery, perhaps 15 minutes to half an hour in total. The Museum can take between half an hour and over an hour and a half if you want to read everything there is. Combinations with other dark destinations: The nearest other dark-tourism attraction in these parts is the Minuteman Missile National Historic Site, just east of Wall. For everything further afield see under USA in general. Combinations with non-dark destinations: The main attraction that brings tourists to this remote part of the Great Plains is Badlands National Park, just south of Wall and north of the Pine Ridge Reservation and Wounded Knee. The Park is indeed worth a couple of days' exploring. The scenery is marvellous and especially atmospheric at sunrise or sunset. In addition you can spot wildlife, such as buffalo, prairie dogs, deer and, if you are really lucky, badgers. A bit further to the west are the Black Hills, formerly a prized territory of the Lakota tribes who have now to make do with drab and flat Pine Ridge Reservation – and who resent the fact that the Black Hill have been taken from them to this day! Within the Black Hills, however, you can find what is the largest, grandest and most over-the-top monument to any American Indian anywhere: the Crazy Horse Memorial. It's a monument in the making and is still far from completion. Currently the only bit that's finished is the face of the fabled Lakota warrior Crazy Horse himself. But that alone is huge: almost 90 feet (27 m) high … it is thus far bigger than those famous US presidents' heads on Mt Rushmore nearby (which are 60 feet/18m high).